When Travis Shewchuk opens the door to his parents’ home, another voice calls out from behind him, and it takes me a minute to figure out where it’s coming from. That’s because, on the couch to my right, there’s an eerily lifelike mould of a character from the zombie film 28 Weeks Later, legs crossed, smiling dementedly. Directly over Travis’s shoulder, meanwhile, is the actual costume worn by the gargantuan villain from Resident Evil: Apocalypse, its prosthetic lips forcibly peeled back in what could be mistaken for a gruesome smile. Dozens of other masks, helmets, battle-axes, military uniforms, recently haunted stuffed animals, complicated crossbows and life-sized barnacle people fill pretty much every other inch of the room. A couple of slightly panicked double-takes later, I realize the voice is coming from the kitchen. Terry Shewchuk, Travis’s father – and the instigator behind one of the best private collections of sci-fi and horror props and costumes on the continent – is coming out to say hello. The Shewchuks’ collection numbers nearly 10,000 pieces, a sampling of which is on rotating display throughout the main floor of their otherwise unassuming split-level home east of Edmonton. (A few additional racks of costumes are kept in the basement; the rest is in storage.) 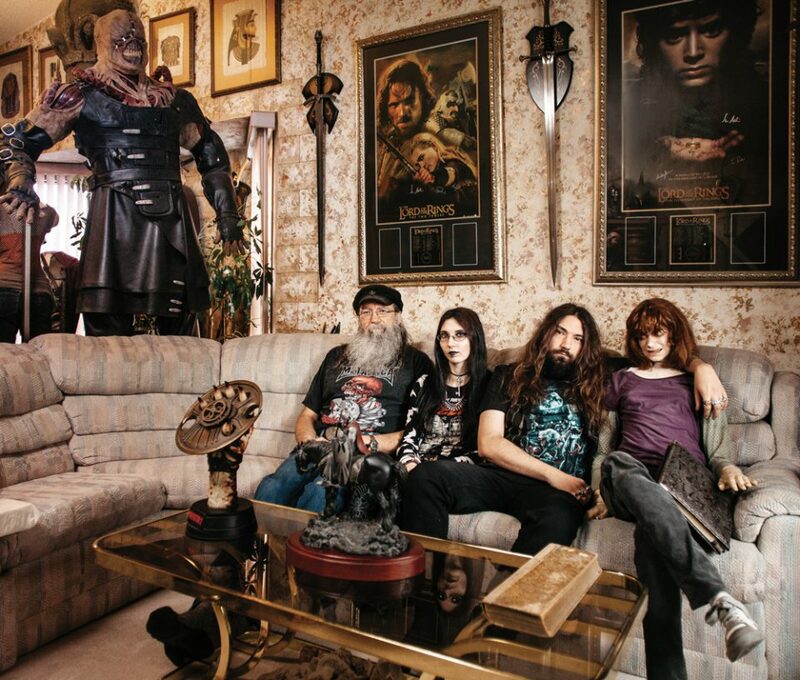 For the Shewchuks, film and TV memorabilia is truly a family affair: Terry, his wife Cindy, and their children, Travis and Trista, have all bought up pieces over the years and added them to the family stash. 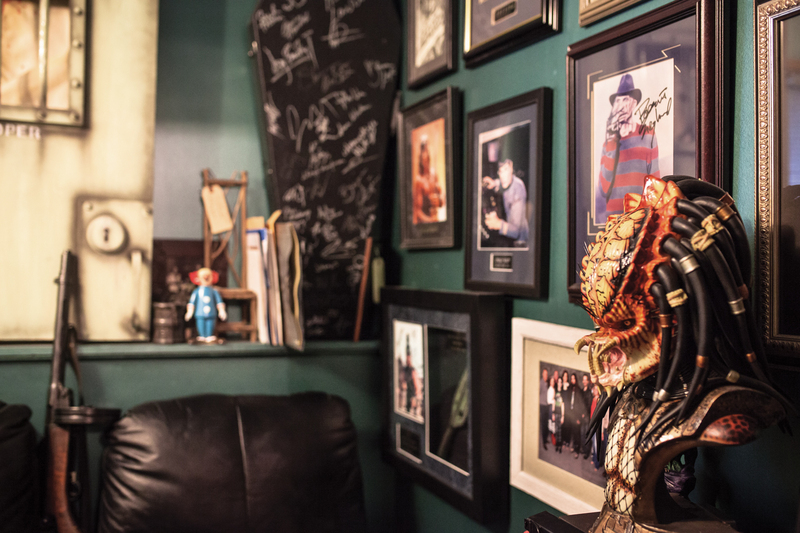 These days, Travis is the owner and founder of Ravenous EFX, a special effects studio of his own that does work for TV shows like Fargo and the forthcoming HBO mini-series, Lewis and Clark (both filmed in Alberta), as well as musical acts like Rob Zombie. He learned his craft by comparing his homemade pieces against the screen-tested ones that were literally lying around the house. Sometimes the bar was lower than expected. “Some things look good on camera that look terrible in person,” Travis says. The Shewchuks display their collection with care and reverence, but it’s also just another part of Terry and Cindy’s home. To get to the laundry room, or feed the cat, you take a left at the mould of Lady Deathstrike from X2 (complete with individually threaded hair and eyelashes) and continue past a haunted pink keyboard from the Poltergeist remake. If you need more cereal from the basement, you might have to push past a few gigantic tentacles from The Outer Limits dangling from the ceiling to find it. Terry says that, while it’s always a thrill to acquire new items, he also just loves the feeling of having these bits of movie history around him. “This is what we live with,” he says. Pieces are organized at whim, and the family cycles through things every few months to make sure there’s always something new to look at. There’s also an element of serious film preservation at play. Until very recently, it was common for productions to simply scrap all of their props and costumes once shooting was complete. “No one thought there was any value past the reusing of things,” Travis says. So even though it might have taken a team of prop makers hundreds of hours to produce everything from a pen on a desk to a 10-foot-tall monster suit, the film industry had little use for keeping these things. The Shewchuks rescue as much of it as they can, often buying up entire pallets from a given set, sight unseen. Such a museum could become the default place for future productions to donate their spent props and costumes. It could even become a tourism attraction in its own right – a prairie pilgrimage for sci-fi and horror fans from around the world. “These pieces are one-offs,” Travis says. Until then, the collection will sit in the Shewchuks’ home, standing guard over the family as they watch TV – maybe even catching a glimpse of themselves on the screen.